We are not gamers at home. In fact, if I play video games too long I get a headache. Yet, I find myself playing Lego Marvel Superheroes with JustaBXgirl, her cousins and grandpa at least once a week for more hours than I care to admit (surprisingly with no headache). That is why I knew I couldn’t pass up the chance to check out three new LEGO video games. Throw in that I got to bring JustaBXgirl and JustaBXgrandpa. Talk about a family fun day!!!! I was invited to attend this event as media. As always opinions are honest and solely mine and JustaBXgirl’s. Posts may contain affiliate links. JustaBXgirl and JustaBXgrandpa met me at the event which means I got to check things out for a little while before they arrived. I also got to hang out with my buddy Nicole from BronxMama, another gaming novice. By the time we finished the 20 minute demo of LEGO CITY Undercover we felt less like novices and more like we could play this for hours. We definitely got our fair share of ribbing from fellow bloggers for not giving others the chance to try. Trust me, if I could get the hang of it your toddler can! Not to mention when JustaBXgirl got there and started playing she needed less instruction than I did to get through the demo! Being part of a blogger family is HARD WORK. LEGO CITY Undercover is being released April 4th and is on my list of games to get when we upgrade our gaming console at home. We currently have Xbox 360 and PS3. I know, I told you we weren’t gamers. I think we will be upgrading to an Xbox One for JustaBXgrandpa’s birthday in June. All of the games we tried out are for PlayStation 4, Xbox One, Nintendo Switch and the PC. One of my favorite things about this game is that it can be two players. When your buddy joins in the screen is split and you both take on the persona of undercover police officer, Chase McCain. I really enjoyed that it doesn’t become a competition between the two players. Instead you both are working towards the same goals as a team. Having more than 20 unique districts to investigate and 15 special assignments to conquer having a partner helps! The other two games we got to try out were LEGO Worlds and LEGO Dimensions. 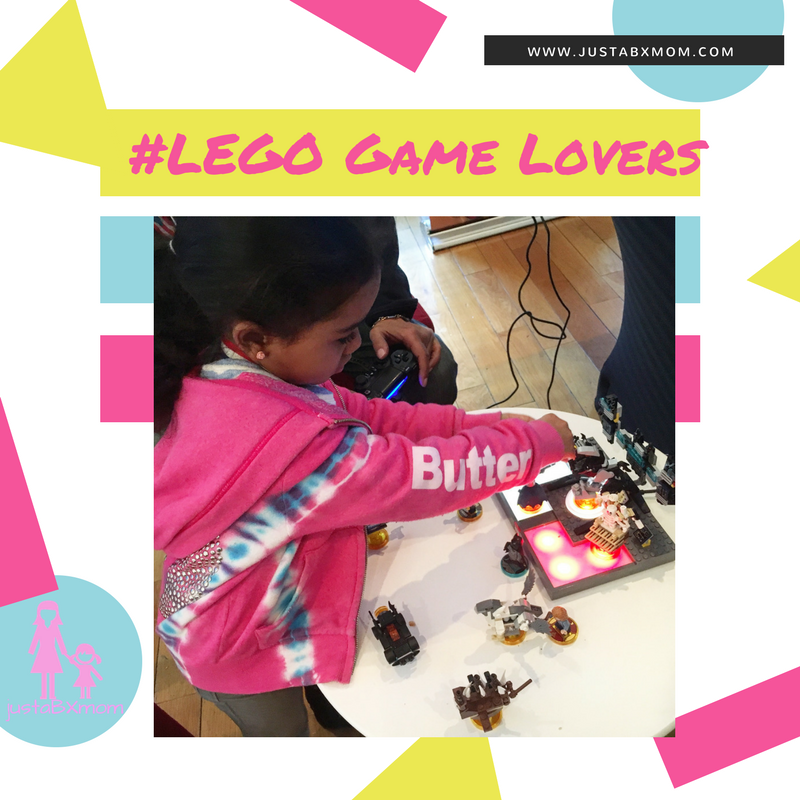 JustaBXgirl became obsessed with Lego Dimensions. I think she really enjoyed being in charge of what characters joined the game. She was so serious about choosing which characters were allowed on the LEGO toy pad and where they would be placed. When we upgrade our console at home this will be one of our first purchases. I like that the mini figures come needing to be put together. That means even if you have a child that will do nothing but video games they will have to build their pieces. The main characters (Batman, Wyldstyle, etc) can be easily put together. The other pieces, vehicles and gadgets, are built by following in-game instructions. JustaBXgrandpa giving JustaBXgirl pointers with LEGO Worlds. JustaBXgrandpa spent the most time out of our trio playing LEGO Worlds. This game is really cool because there is always something new to discover. Players can use building tools to alter the Worlds . There are a variety of quests to embark on as you aim to become a Master Builder. Also, if you’re looking for competition this game allows online multiplayer ability. Two players can explore each other’s Worlds, play competitive challenges and show off their creations. As a mom I like that the LEGO games are family friendly. I don’t worry about JustaBXgirl playing them and hearing or seeing something inappropriate. As a player I like that you don’t need a degree in gaming to get the hang of how to play. We might not become professional gamers at home but we will continue to play LEGO games for some family fun.